The Adventures & Travels of RoadAbode: RoadAbode ~ RV RoadTripping ~ Railroad Fan in the Family? Head to Pennsylvania! RoadAbode ~ RV RoadTripping ~ Railroad Fan in the Family? Head to Pennsylvania! Pennsylvania has a rich heritage in railroading. Railroads extended into virtually every corner of the state and the rails became part of a way of life during the Industrial Revolution. Tons of goods, both perishable and non-perishable, were - and still are - sent by freight train. Because a station or depot was in the heart of local communities, the comings and goings at a train station of famous and common people alike ended up as important headlines in the local newspaper. People traveled by train to visit family and friends. A train was a way to get to a job, or get to shop the latest fashions in the "big cities". Men went off to war, trains brought them back home to loved ones. Travel by train allowed quick trips, and a freedom that many would not had in those times by alternate forms of transportation. Even as a boy in the late 1960s, I can still remember the excitement of taking an electric powered commuter train into Center City Philadelphia. Reading Terminal station, and it's farmers market were a crazy, whirlwind of sights, smells and sounds. Oh, mom could have made us taken the bus, but - the train! That was the cool way to go. Though perhaps the arrival and departure of rail cars does not incite as much excitement as those years long ago, railroads still play an important role in moving goods and people every day in Pennsylvania. Even though we now have interstates to swiftly move us from one destination to another, there is a nostalgia, or sense of serenity seated in a train watching the world go by. For those that really love the "clickty-clack" of the rails, or that distinct scent of greasy steam, there is nothing more fun than a ride on a coach pulled by a big ol' steam engine. There are still places to enjoy the scenery as you pass the changing landscape pulled along by these behemoths. How interesting it is to inspect the mechanisms and workings of those old engines up close! Riding a scenic railway is a great way to see the landscape, relax and enjoy the company of family or friends. Below, the RoadAbode Crew highlights a few places for the RVing rail fan in your family or group of friends. Check out these places to learn about, play with, get up on, and close to the Iron Horses of Pennsylvania. Right next door (and a combined ticket is available) to Strasburg Railroad is the Railroad Museum of PA. The museum has more than 100 historic pieces of rolling stock in their collection, including passenger, freight, and maintenance pieces, in addition to their locomotives. Some locomotives can be climbed into and onto, bringing alive America's railroading history. Interactive displays allows visitors to "take the throttle" on a simulated run in a real freight locomotive, climb aboard a caboose, inspect a 62-ton locomotive from underneath, and view restoration activities on the iron horses via closed-circuit television. The museum offers plenty of other exhibits, which include several model railroad layouts, an educational center, a library with archives, and a smaller exhibit gallery on the second floor. One weekend the RoadAbode Crew visited, there was an author giving a presentation about hobos and train hoppers of the 1920s and 30s, which was the topic of his book. It was really interesting to lean the codes and language of the people from the era. Open since 1975, the museum has grown to 18 acres of land, including 100,000 square feet indoors. For something you can play with rather than ride, this museum near Strasburg holds a collection of toy trains which dates from the early 1800s to current train sets. Trains are collected according to gauge, age, manufacturer and rarity. Five operating, interactive train layouts in G, Standard, O, S and HO Gauges. Videos on all aspects of toy trains play throughout the museum. You can find Lionel, American Flyer, MTH, Weaver, LGB, Bachmann, Marklin, and more manufacturers of toy trains on display, or operating. Many of the layouts for the trainsets are arranged so all you have to do is push a button, and they run a predetermined track and path. Each large layout represents a different period of the 20th Century. The museum als houses a research library, which has a vast collection of information on the history and characteristics of toy trains in the United States and elsewhere. The Choo choo barn was formed by one family's love for model railroading. The massive interconnected layout features many local Lancaster County buildings and landmarks. Some of the pieces incorporated into the scenery date from the original platform the family built in 1940s. Back in the beginning, the train platform was for display only for family and friends, setup in the family basement. In the 1950s they shared the growing layout with school and church groups. By the 1960s the family wanted to earn extra money for college, so in 1961 they moved everything to an unused township building and created a 600 square foot layout with six running trains. Every year since they have added to the layout, and to the building or landscaping. Whether you enjoy model railroading or just like looking, there are unique animatronics and details through the Choo Choo barn to be found. Visit www.choochoobarn.com/ to learn more about the Choo Choo Barn. Also worth a trip is the National Christmas Center & Museum, While not specifically train-centric, the museum, it does have a large part of it's display dedicated to toy trains. Toyland Train Mountain stands three tiers high and thirty feet in diameter. Besides the train room, there are also a walk thru olde time Woolworth display, and village highlighting Christmas traditions from around the world. There are some great places the RoadAbode Crew have stayed in Lancaster County Click here for our favorite campgrounds in this area. Housed is the site of the former Scranton yards of the Delaware, Lackawanna and Western Railroad (DL&W), Steamtown is in the downtown of Scranton, and encompasses over 62 acres of land. The museum is built around a working turntable and a roundhouse and is actially reconstructed from remnants of a 1932 structure that was originally on the property. 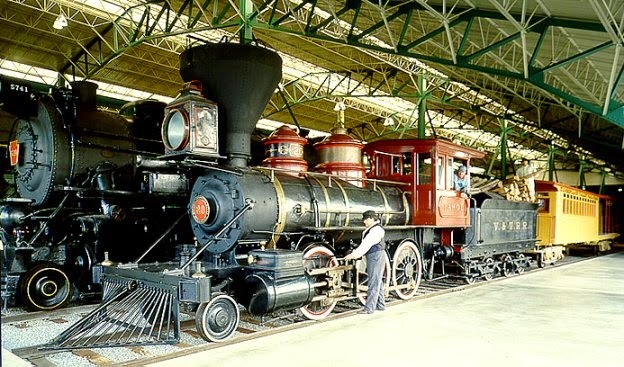 The museum tell the story about the history and technology of steam railroads in the United States and life on the railroad. A steam locomotive with cutaway sections helps visitors understand steam power. Park rangers and volunteers offer a variety of demonstrations, tours, and excursions that demonstrate how railroads functioned in the age of steam. Several working locomotives take visitors on short excursions through the Scranton yard in the spring, summer, and fall. Longer trips are a seperate cost from Steamtown admission and are scheduled to various nearby towns, including the Lackawanna River valley and Carbondale, Tobyhanna and Moscow, Pennsylvania. On rare occasions, excursions are run to the Delaware Water Gap, East Stroudsburg, and Cresco, Pennsylvania, or on the Canadian Pacific Railway to Binghamton, New York. Campground to check out nearby : Cozy Creek Family Campground For a great state park, check this link to learn about a park the RoadAbode Crew really enjoyed. Probably not the first place to think of railroading, Knoebel's amusement park has two great steam engines that you can ride. Though miniature compared to true iron horses, the rides are fun for old and young alike. Old Smokey a coal burning coal-fueled steam locomotive takes you around and through the grove where children's rides, the lumber mill, and blacksmith reside. Pioneer Train, run on gasoline power takes a journey through the woods and close to the the Knoebels campground. Both engines are from 1960, with passenger cars dating from 1946. Many of the attractions of the park are beautifully maintained from the early 1900s. Kids of all ages enjoy coming year after year. The railroad was originally known as the New Hope Branch of the Reading Company, which leased the North Pennsylvania Railroad, of which it was a part. n 1914, a segment of the classic silent film The Perils of Pauline was filmed on the tracks now used by the New Hope and Ivyland Railroad. the railroad operates wine and cheese tasting trains dubbed the Grapevine Express. On select weekends, the railroad runs its Evening Star Dinner Train between New Hope and Buckingham Valley. Check https://www.newhoperailroad.com for more information. Steam into History is located south of York PA Opened in 2013 This non-profit's locomotive and train set are a faithful replica of the 1860's train Abraham Lincoln rode to present the Gettysburg Address and two years later carried his body in a funeral car. Codorus State Park is only twenty minutes from Steam into History. The Oil Creek and Titusville Railroad (OC&T) is a tourist ride through the valley where oil was first discovered and refined in the United States. The OC&T is notable in that it operates the only working Railway Post Office in the United States. For income, it may carry a few freight cars at the end of the passenger cars. Excursions operate over tracks that were originally built as the main line of the Buffalo, New York and Philadelphia Railroad in the 1880s. Oil City is known as the site of the world's first oil field. Unlike the previous railroad railroads mentioned, OC&T does not have any steam stock, and it's oldest engine is from 1947. The train does pull through some beautiful countryside, featuring special fall foliage and murder mystery excursions. Located in the the quaint town of Jim Thorpe, this train line follows the former Lehigh Valley main line, along state park rails-to-trails, and rounding curve after curve along the Leigh River. Pulled by modern deisel locomotives, the passenger cars are either standard coach style, or open air car that has a roof over its top, a bench that runs down the middle, and the sides of the train car are completely open. People can get up and walk around or stand in this coach to look at the passing scenery. Unique to the Lehigh Gorge railway is the opportunity to take the train one way and ride back by bike. You can either bring your own, or rent a bike It takes most people 3 to 4 hours to bike the returning slightly downhill 25 mile trail. If in the Philadelphia area, besides riding the commuter rails of SEPTA, check out the beautiful outdoor multi level layout offered at Morris Arboretum. The display and buildings are all made of natural materials and feature Philadelphia Landmarks. The railway is going into it's 17th year in 2015. For great reads on the History of Railroading in Pennsylvania, check out the books by Pennsylvania transportation historian Dan Cupper below. The RoadAbode Crew would love to hear about your favorite places to enjoy the history of railroading in Pennsylvania. Did we miss any great places to visit? Share your favorite places, and tips or secrets how to best enjoy the places we mentioned above. Please post in the comments below to let others know about the great ways to enjoy railroading in PA!